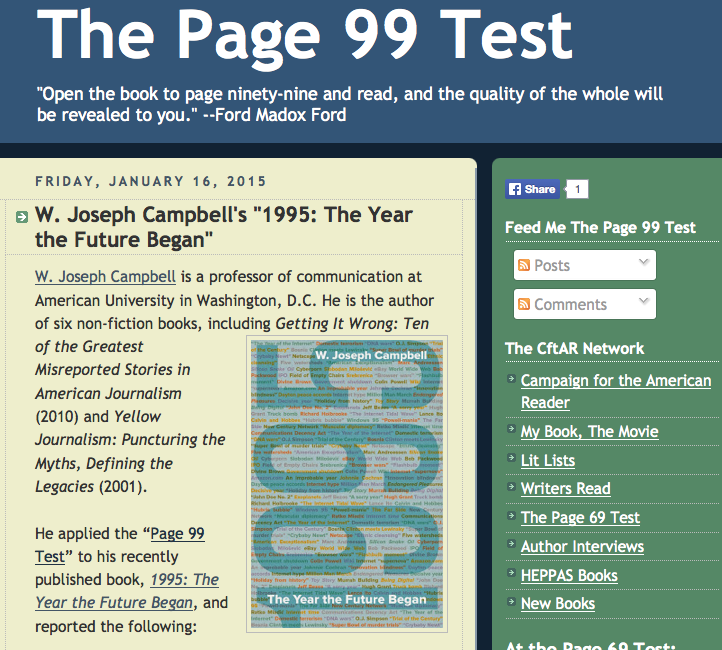 The “Page 99 Test” holds that the contents of page 99 offer revealing insight about the rest of the book. 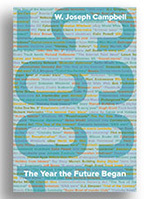 It is an intriguing if serendipitous approach to assessing quality, and the author of “The Page 99 Test” blog, Marshal Zeringue, recently asked me to apply the test to my new book, 1995: The Year the Future Began, and write about what I found. I am intrigued by the Page 99 Test, about which I learned only recently. I described the concept to a class of honors students in Fall semester 2014, but they were mostly skeptical. I am undeterred, though, and intend to incorporate the benchmark test in semesters ahead. Page 99 of my latest book, 1995: The Year the Future Began, offers a revealing glimpse at one of the most important lasting consequences of 1995 and the so-called “Trial of the Century” — the proceedings where O.J. Simpson answered charges of slashing to death his former wife, Nicole, and her friend, Ronald Goldman, outside her Los Angeles townhouse in June 1994. But with the critical distance offered by the passing of nearly 20 years, those characterizations seem hyperbolic, and even a bit absurd, especially as the Simpson case exerted almost no lasting influence on American jurisprudence and legal doctrine. Nor did the case offer long-term lessons about race relations in America. (Simpson, who [is] serving a prison sentence in Nevada on criminal convictions unrelated to the 1994 murders, is a black former professional football star. His former wife and Goldman were white.) Simpson’s acquittal in the “Trial of the Century” shocked many white Americans and elated many African Americans. Those disparate reactions were striking and widely discussed in October 1995, but they had little lasting effect. Polling data show that the Simpson verdicts did not leave enduring strains in white-black relations in America. The most important lasting contributions of the Simpson trial came in introducing to mainstream American culture the promise and potential of forensic DNA testing. Although the prolonged presentation of genetic evidence was the trial’s most tedious stretch, the Simpson case allowed the American public to gain familiarity with DNA testing, a familiarity that has deepened since 1995. Simpson’s acquittal — due in measure to the sloppy collection and analysis of genetic evidence — also encouraged a push for improved procedures in gathering, storing, processing, and analyzing DNA evidence samples. This entry was posted on January 16, 2015 by W. Joseph Campbell in DNA, Simpson trial, Watershed year and tagged 'Trial of the century', 1995, Book blog, Crime, CSI: Crime Scene Investigation, Forensic DNA, O.J. Simpson, Page 99 Test, scandal, Watershed year.